As soon as the show started with the contestants appearing on stage at 11 p.m. sharp, the whole audience screamed in support of their teams. Busker Busker took to the stage first followed by Two Months and Ulala Session. The songs performed were chosen by each contestant’s fan group, who voted by text message for the song to best show their team’s talents. With the duo Two Months eliminated due to a weaker-than-expected performance, two completely different bands ― vocal-oriented quartet Ulala Session and three-part indie band Busker Busker ― were chosen as the final contestants. To reach the final stage, the contestants went through a massive competition against a total of 2 million people consisting of not only Koreans, but star aspirants from abroad as well. The show is huge in Korea, with more than 1 million people voting via text message last Friday alone, according to Mnet. The average viewer rating of the program was 12.9 percent from 11 p.m. to 1 a.m., the highest among all terrestrial and cable channels that day. At the larger venue, Jamsil Gymnasium, on Friday night, Ulala Session and Busker Busker will vie for the 500 million won prize money and a chance to perform live at the 2011 Mnet Asian Music Awards on Nov. 29 in Singapore. And the final winner, whoever it may be, will be ‘singing a miracle,’ just as the show’s slogan reads. Ulala Session, consisting of leader Im Yoon-taek, Kim Myung-hoon, Park Seung-il and Park Kwang-sun, performed Park Jin-young’s “Swing Baby” on Friday. The four guys’ musical-style performance, with a strong backing of a brass section and dancers on stage, was jaw-dropping. The vocal power was stronger than in the original song, the dance was more exciting and the acting of the youngest member, Park, was professional. “This is like cheating. I thought I could find a flaw in you today, but well, I couldn’t,” singer and judge Lee Seung-chul said. “You reveal more and more charm as you advance on to the next stage. You seem like you’ve been expecting to reach the final from the beginning,” another judge, Yoon Jong-shin, said. Ulala Session’s covers such as “Open Arms” and “Seojjok Haneul” (West Skies), which they performed live during the on-air rounds, rank highly on online music portals. The group has been together for more than 10 years, although each member has a different job ― Im is a performance show director, Park Seung-il is in the fashion industry, Kim is a photographer and Park Kwang-sun is self-employed. Korean Internet users often call them “low-tier Brown Eyed Soul” ― offering a similar sound to famous group Brown Eyed Soul at concert stages that do not pay highly. And the group has a unique and heart aching story. Team leader Im, 32, is fighting stage four stomach cancer. Despite the illness, he always stays positive about life and his energy has injected passion on stage as the group advances to the next round of the show. If Ulala Session wins, Park Seung-il said he wants use the money for Im’s medical expenses. 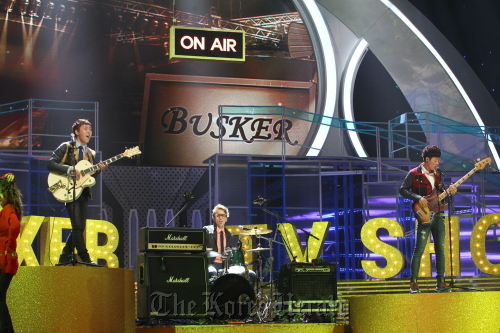 Indie trio Busker Busker, consisting of Jang Bum-jun on vocals and guitar, Bradley Rey Moore on drums and Kim Hyeong-tae on bass, had a close shave when the team failed to reach the top 10. But due to the voluntary withdrawal of Yeri Band, which accused Mnet of false editing of the program, the judges chose Busker Busker as a replacement. From that moment, the band revealed its genuine charm ― creatively rearranging famous songs so well that even the judges say they learn from the group. During the semifinal on Friday, Busker Busker performed “Valenti,” originally sung by K-pop idol BoA. With upbeat drums and fast-paced guitars, the group was able to deliver its unique “enjoyable spirit” but the performance overall was not impressive enough to wow the audience. “It seemed like you intentionally tried to avoid the demerits of the original song, rather than giving it a fresh try,” judge Lee said.